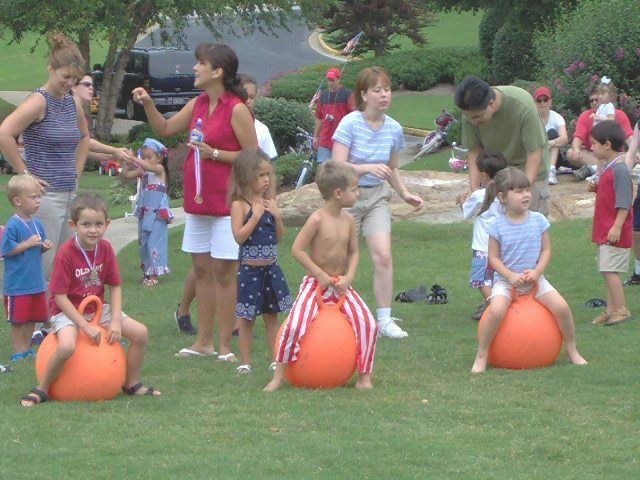 Kids Outdoor Party Games – There are many games that will kids entertained for hours. 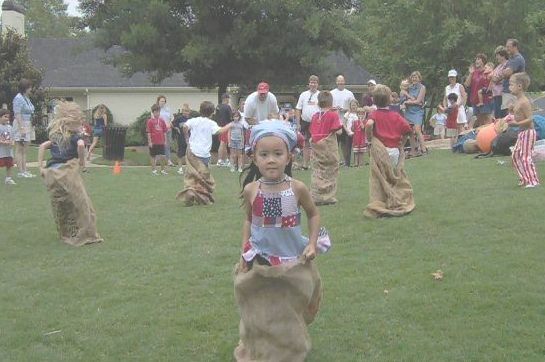 Children get into sacks and hop toward the finish line. As potatoes no longer come in sacks, it’s best to use coffee sacks, which may be obtained for free or little cost from coffee shops. Partners are chosen, and one leg of each is tied together. The players must walk together to the finish line and back. First team that makes it back wins. Players place egg on spoon, put one hand behind their back and walk toward the finish line. First contestant over the line wins. We’ve found that wooden spoons with long handles and Styrofoam eggs seem to make the best combination. This is one of the most popular kids outdoor party games. Players sit on Hippity Hops (see picture above) and jump to the finish line. The first contestant over the finish line wins. Children choose partners and stand back-to-back, interlocking arms. The players then race to the midway point of the course, with one child walking forward and the other backward. Once the midpoint is reached they reverse positions. First team over the finish line is declared the winner. Players choose partners and one of them scrouches down. The other player then leaps over them and scrouches down. The partners then continue this until they reach the end. The first team over the finish line wins. It’s best to have equally-sized partners. 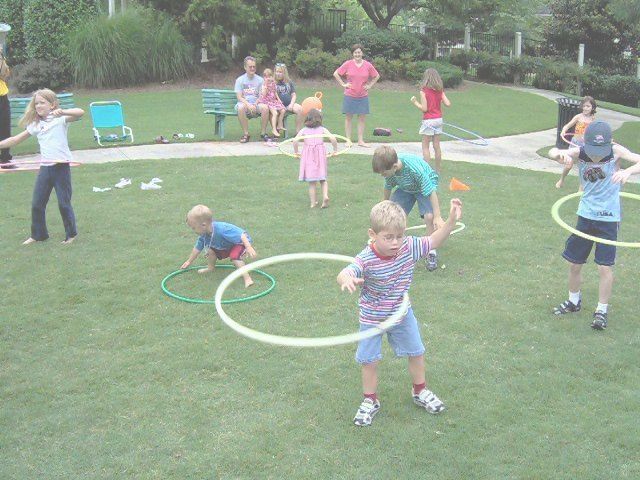 Each child is supplied with a hula hoop and tries to keep it in motion around their hips. The last one remaining with a hoop in motion is declared the winner. Ties may be broken by supplying additional hulas, and letting them compete. We’ve had players with as many as four hoops competing. This game is best played to music. Each participant has a balloon (usually 8 or 9 inch) tied to his or her ankle. When the whistle blows, all players attempt to stomp on each others’ balloons. The last one remaining with an intact balloon is the winner. Two groups of players are chosen, hopefully of equal number and strength. Two cones are placed in the middle and the teams are told to pull the rope. A team wins when they are able to pull the other team past the middle. A one inch, 100 foot rope is recommended. Balloons are filled with water, and all the players choose partners. They line up facing each other (see picture), and one side of the line is given balloons. On the count of three the balloons are tossed to their partners. The teams that drop the balloon (or it breaks) are eliminated. The players holding the balloons take a step backwards, and the process is repeated until there is only one team remaining. This game is best played during the summer months. 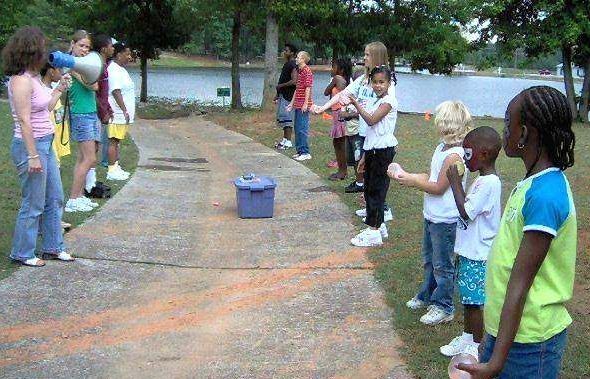 It’s usually one of the last kids outdoor party games played at an event. This is the most requested of all the kids outdoor party games.